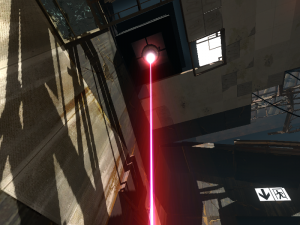 The Thermal Discouragement Beam (referred by GLaDOS as "deadly laser,") is a Test Chamber mechanic introduced in Portal 2. The Beam is fired in a straight line from an immovable device built into the wall or ceiling of a Test Chamber. Each Beam is usually coupled with one Receptacle, and multiple Beams with multiple Receptacles may be present within a single Test Chamber. Directing the Beam into the Receptacle will activate certain mechanics that are crucial in reaching the chamber exit. The Beam can also be used in conjunction with Relays, which are small nodes built into the floor of some Test Chambers. Relays are activated when the Thermal Discouragement Beam passes through them, and multiple Relays must often be activated using a single Beam. Once all Relays are activated, specific Test Chamber mechanics will be triggered, similarly to the activation of a Receptacle. Thermal Discouragement Beams can be angled in certain directions with the use of the Discouragement Redirection Cube and portals. Additionally, the beam holds the ability to travel through transparent objects such as glass. Turrets will explode after a few seconds of contact. Touching the beam while on the ground will push the player away, as well as deal a small amount of damage. Prolonged exposure will result in death. The Thermal Discouragement Beam as it appears in Chamberlock informational videos. This page was last modified on 10 October 2017, at 23:37.